Samsung Files Patent for Foldable Smartphone! Samsung Files Patent for Foldable Smartphone; But Is There Any Utility For It? There was a time in 2013 and 2014 when Samsung was trying to innovate with its smartphones, to gain an edge over the popular iPhone series. The Samsung Galaxy Round made headlines with a curved screen, which was very awkward and quickly lost importance in the market. After losing a long patent battle to Apple last year, Samsung has been very cautious of launching new products in the market. One such example is the Galaxy Edge series, which took the premium smartphone market by storm. In November 2015, Samsung filed a patent with the United States Patent and Trademark Office(USPTO) for a foldable smartphone. The smartphone bends in half from the middle that houses a charging port. The initial iteration of the smartphone will be a premium one, which could spread to mid-range as well in near future. Let us take the example of Samsung Galaxy S7 that has a huge screen in front and a glass panel at the back. The patent filed by Samsung would give the smartphone an ability to fold from the middle, or any part of the body depending on the utility. As soon as the phone bends from the hinge, a charging port is revealed, which seems like a very awkward place for one to use. The charging port can be used only when the smartphone has been folded and is not in use, thereby reducing the usability of the phone. The smartphone is also said to have a slightly curved display, much like the LG G Flex, to allow easier use. The smartphone could have a fingerprint scanner or an iris scanner for security. What’s wrong with the design and what can Samsung do to improve it? First and foremost, not having the ability to use the smartphone while charging can be frustrating for the users. We hope Samsung reconsiders the positioning of the charging port. We also hope that the port in the patent photos is not a charging one, but just a docking point. In case Samsung goes ahead with this design, then a secondary display will be a must on the back panel of the phone to continue functions during charging mode. It does not make sense to restrict the purpose of the phone only to charge the battery. Another design flaw seems to be the curved design clubbed with a foldable structure. An inward curve on both ends, when folded, will give the phone an unnecessary thickness to add to the bulkiness of the phone. As it is smartphones are huge these days, so folding it in half will add to the bulkiness factor. However, we feel keeping a folded phone in the pocket might be a little convenient, considering the thickness of smartphone these days. However, a curve is bound to make it uncomfortable for the user and Samsung must think about installing flexible displays. All in all, Samsung needs to innovate with the screens, batteries, body structures and displays to understand its users. Foldable phones are not a big deal, we have been seeing clamshells for a very long time. What do you think about the phone design? Will Samsung be able to sell such smartphones? Comment below and let us know your thoughts. 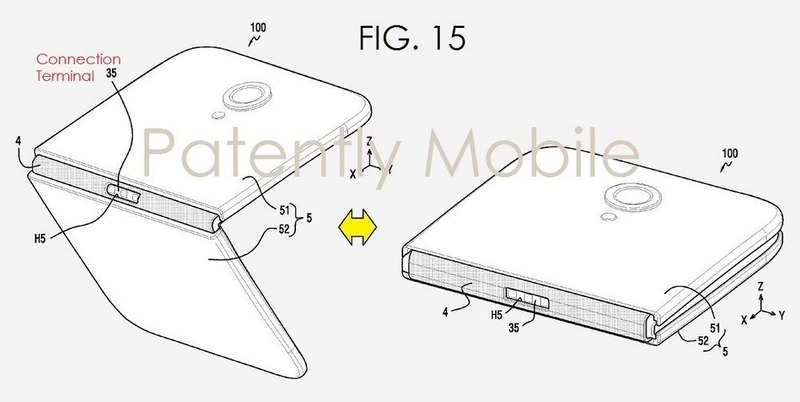 "Samsung Files Patent for Foldable Smartphone; But Is There Any Utility For It? ", 2 out of 5 based on 3 ratings.